Lyndon Baines Johnson was the thirty-sixth president of the United States, serving from 1963 to 1969. Like three other vice presidents in U.S. history, he assumed the office following the assassination of the president. He took office November 22, 1963, after john f. kennedy was killed in Dallas. 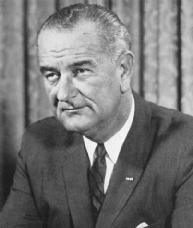 Johnson's administration was marked by landmark changes in Civil Rights laws and social welfare programs, yet political support for him collapsed because of his escalation of the Vietnam War. Johnson was born August 27, 1908, near Stonewall, Texas. He was raised in Johnson City, Texas, which was named for his grandfather, who had served in the Texas Legislature. Johnson's father, Sam Ealy Johnson, also served in the Texas Legislature. Johnson graduated from Southwest Texas State Teachers College in 1930 with a teaching degree. He taught high school in Houston, until 1931, when he became involved with Democrat Richard M. Kleberg's campaign for the U.S. House of Representatives. Johnson gave speeches and spoke to voters on Kleberg's behalf. When Kleberg was elected, he asked Johnson to accompany him to Washington, D.C., as his secretary. Johnson agreed, and his political career in Washington, D.C., was launched. Johnson was not satisfied to be a secretary to a congressman. He began making friends with powerful Democrats, most notably Representative Sam Rayburn, of Texas. Rayburn, who would soon become Speaker of the House, had enormous influence. In 1935, after President franklin d. roosevelt named him director of the Texas division of the National Youth Administration, Johnson used his connections to put twelve thousand young people to work in public service jobs and to help another eighteen thousand go to college. He quit this position in 1937 to run in a special election for the U.S. House of Representatives in Texas's Tenth Congressional District. In his campaign he supported Roosevelt's policies, which came under heavy attack by Johnson's opponents. After Johnson was elected, Roosevelt made a point of getting to know him. Soon the two developed a long and lasting friendship. Johnson remained in the House of Representatives until 1948, though he did spend a brief period in the Navy during World War II. He ran for the U.S. Senate in 1941, and lost to Governor W. Lee O'Daniel by fewer than fourteen hundred votes. He ran again in 1948, this time against Coke R. Stevenson, a former Texas governor. Johnson won the 1948 Democratic primary election by eighty-seven votes, but Stevenson claimed that election Fraud had allowed Johnson supporters to stuff the ballot box with votes from dead or fictitious persons. A federal district court judge ordered Johnson's name removed from the final election ballot pending an investigation of the fraud charges. Johnson enlisted a group of prominent Washington, D.C., attorneys, led by Abe Fortas, to overturn the order. The attorneys convinced Justice hugo l. black, of the U.S. Supreme Court, to reverse the order. With his name back on the ballot, Johnson went on to an easy victory. Johnson moved quickly to gain power and influence in the Senate. Senator Richard B. Russell, of Georgia, became his mentor in the same way Sam Rayburn had been in the 1930s. In 1951 Johnson became the Democratic whip, which required that he maintain party discipline and encourage the attendance of Democratic senators. Two years later he was elected minority leader, at age forty-four the youngest member ever elected to that position. In 1955, after the Democrats took control of the Senate, he assumed the position of majority leader, the most powerful position in that body. As majority leader Johnson worked at developing consensus with members from both parties. During this period he became famous for the "LBJ treatment," where he would use clever stratagems and steady persuasion to win reluctant colleagues over to his side. He developed a bipartisan approach with the administration of Republican president dwight d. eisenhower and sought common ground. He sustained a setback in 1955 when he suffered a heart attack, but returned to government service later that year. Johnson wanted to be president, and he knew that opposing civil rights would destroy his chances on a national level. He was one of three Southern senators who refused to sign the Southern Manifesto, a 1956 document that urged the South to resist with all legal methods the Supreme Court's decision outlawing racially segregated schools in brown v. board of education, 347 U.S. 483, 74 S. Ct. 686, 98 L. Ed. 873 (1954). In 1957 he put through the Senate the first civil rights bill in more than eighty years. Senator John F. Kennedy, of Massachusetts, won the Democratic presidential nomination in 1960 and named Johnson his vice presidential running mate. Johnson helped Kennedy in the southern states, and Kennedy won a narrow victory over Vice President richard m. nixon. As vice president under Kennedy, Johnson performed numerous diplomatic missions and presided over the National Aeronautics and Space Council and the President's Committee on Equal Employment Opportunities. When Kennedy was assassinated in 1963, Johnson took the oath of office in Dallas. In the months that followed, he concentrated on passing the slain president's legislative agenda. He proposed a war-on-poverty program, helped pass a tax cut, and oversaw the enactment of the landmark Civil Rights Act of 1964 (42 U.S.C.A. § 2000a et seq.). This act outlawed racial and other types of discrimination in employment, education, and public accommodations. Civil rights for all persons was one part of Johnson's vision of what he called the Great Society. "Poverty has many roots, but the tap root is ignorance." Johnson easily defeated conservative Republican senator barry m. goldwater in the 1964 presidential election. Under his administration Congress in 1965 enacted the Medicare bill (42 U.S.C.A. § 1395 et seq. ), which provided free supplementary health care for older persons as part of their Social Security benefits. Johnson also obtained large increases in federal aid to education; established the Departments of Transportation and of housing and urban development; and proposed the Voting Rights Act of 1965 (42 U.S.C.A. § 1971 et seq. ), which ensured protection against racially discriminatory voting practices that had disenfranchised nonwhites. This act changed the South, as it allowed African Americans to register to vote for the first time since Reconstruction. Finally, Johnson appointed to the U.S. Supreme Court Thurgood Marshall, the first African American to sit on the High Court. International affairs did not go as smoothly for Johnson, especially regarding Vietnam. Kennedy had sent U.S. advisers to help South Vietnam repel what the government characterized as a Communist insurgency that was supported by North Vietnam. Johnson did not wish to abandon the South Vietnamese government, and soon his administration began escalating U.S. involvement. In August 1964 Johnson announced that North Vietnamese ships had attacked U.S. naval vessels in the Gulf of Tonkin. Johnson asked Congress for the authority to employ any necessary course of action to safeguard U.S. troops. Based on what turned out to be inaccurate information supplied by the Johnson administration, Congress gave the president this authority in its gulf of tonkin resolution (78 Stat. 384). Following his reelection in 1964, Johnson used this resolution to justify military escalation. In February 1965 he authorized the bombing of North Vietnam. To continue the protection of the South Vietnamese government, Johnson increased the number of U.S. soldiers fighting in South Vietnam from twenty thousand to five hundred thousand during the next three years. As the war escalated, so did antiwar sentiments, especially among college students, many of whom were subject to military Conscription. As casualties mounted, antiwar demonstrations increased and support in Congress decreased. The strategy of escalation did not produce the victory military leaders predicted. The cost of funding a war ended Johnson's Great Society initiatives. More important, the Vietnam War became the focal point for the nation. Johnson's popularity plummeted, and the nation was torn by conflict over the unpopular war. On March 31, 1968, Johnson announced he would not seek reelection. He spent the remainder of his term attempting to convince the South and North Vietnamese to begin a peace process. By the end of his administration, the Paris peace talks were started, which began a long negotiating process between North and South Vietnam. Johnson left office in January 1969 and returned to his ranch near Johnson City. There he wrote an account of his years in office, The Vantage Point: Perspectives of the Presidency (1971). His health deteriorated. Johnson died of a heart attack at his ranch, on January 22, 1973, less than one week before the signing of the accords that ended the Vietnam War. Cowger, Thomas W., and Sherwin Markman, eds. 2003. Lyndon Johnson Remembered: An Intimate Portrait of a Presidency. Lanham, Md. : Rowman & Littlefield. Langston, Thomas S. 2002. Lyndon Baines Johnson. Washington, D.C.: CQ Press. Unger, Irwin, and Debi Unger. 1999. LBJ: A Life. New York: Wiley. "Voting Rights Act Address" (Appendix, Primary Document). Archives, Lyndon Baines Johnson Library and Museum Web site, 4-8-05. The scene is recalled by Nick Kotz in his new book, Judgment Days: Lyndon Baines Johnson, Martin Luther King, Jr. They had Lyndon Baines Johnson, a liberal Democrat, in the White House. RICHARD BYRNE'S ARTICLE on the legacy of Lyndon Baines Johnson ["Lyndon Agonistes," August 2004] is correct in its assertion that LBJ deserves his place as one of progressivism's greatest champions. 1964 * President Lyndon Baines Johnson signs the Civil Rights Act into law, giving federal law enforcement agencies the power to prevent racial discrimination in employment, voting and the use of public facilities. When he went to Montgomery in 1956 to advise a political novice named Martin Luther King, the radical Rustin was quickly spotted as a threat to the movement by influential Democrat Lyndon Baines Johnson, who encouraged leading black politico Adam Clayton Powell to attack Rustin, citing the Pasadena arrest. Another must-see attraction is the Lyndon Baines Johnson Presidential Library and Museum. Michael Parrish, archivist at the Lyndon Baines Johnson Library and Museum and editor of a Civil War book series with Louisiana State University Press, was recognized at the November 2001 meeting of the Society of Civil War Historians for his valuable contributions and hard work. When Lyndon Baines Johnson became president on November 22, 1963, he was considered by many in the beltway establishment to be a boorish hick--bossy, uncouth, and larger than life. I amble over to this big table and riffle through piles of Ike Morgan's paintings--down in Austin the state of Texas has had to rent space to store Ike's work, since he is a working fool and the state has been in charge of him since 1977--and there is Lyndon Baines Johnson. Lyndon Baines Johnson was the man we loved to hate, the president who escalated the Vietnam War and became the target for demonstrations all over the world. Although Lyndon Baines Johnson was sensitive to criticism, Hope, the elder statesman of wit, kept the crucible bubbling.